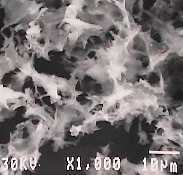 It is the photograph of the silkpure by an electron microscope. The LifeTechLab Inc. provides natural material and it's technique. The business contents: The LifeTechLab Inc. provides natural material (silkpure) and it's technique. The silkpure (Fibroin microstructure) has acquired an American patent and It is applying in Japan. Then,it is moreover providing the other technique,too. For example,it is to make silk powder.